Angela of Foligno, "Female Evangelist"
It is important to note that doubts have been raised about whether such a historical person as "Angela of Foligno" ever existed. For his part, McGinn notes that there is a middle ground between taking later accounts of her life at face value and dismissing her biography as a "mystic tale." We will follow McGinn, then, in saying that Angela of Foligno was probably born about the year 1248, in the Umbrian province of Perugia, to a fairly affluent family. She was married and had a number of children. But by 1388 Angela's "problem" was solved--her mother died, and then, a few months later, her husband and children died. Angela was able to begin her religious life by giving away her possessions. In 1292, under the direction of a spiritual adviser whom McGinn refers to as "Brother A." 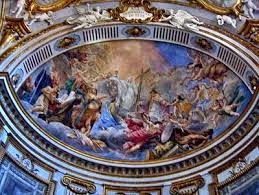 (other sources identify him as Father Arnoldo of Foligno), Angela began to dictate the story of her conversion and a "narrative of her inner journey," twenty stages on "her itinerary to God." A further set of ten stages, which Brother A. found difficult to understand and condensed into seven "supplementary stages," were incorporated into her memoriale, completed in 1296. In 1298, according to McGinn, the book was submitted for approval, which it received. Brother A then revised the Memorial (1299-1300), adding a series of thirty-six instructiones, which "reflect Angela's teaching between 1296 and her death in early 1309." 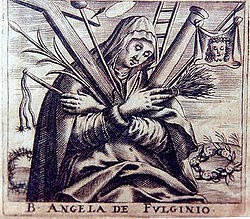 The whole is known today, depending on the edition or translation, as Il libro della Beata Angela da Foligno, The Spiritual Journey of the Blessed Angela of Foligno according to the Memorial of Brother A, or Angela of Foligno: Complete Works. 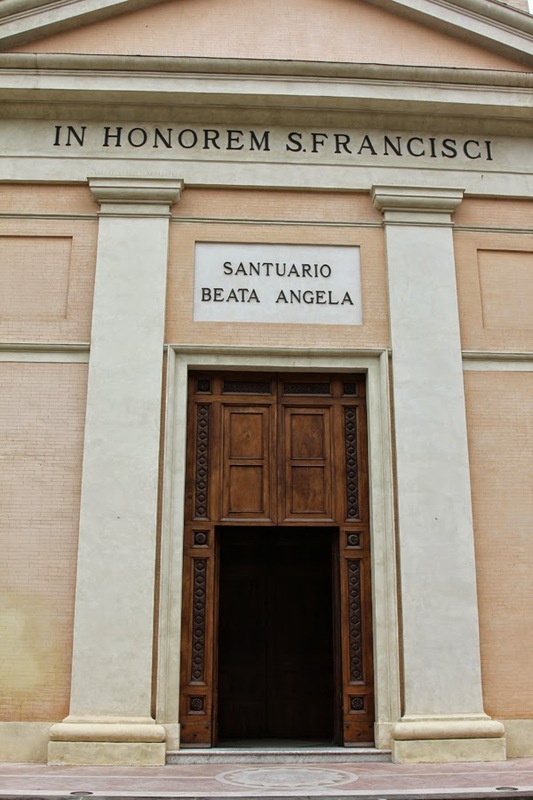 Angela of Foligno was beatified by Pope Clement XI on 11 July 1701. In 2010 Pope Benedict XVI spoke on Angela at a general audience. Angela of Foligno was given an "equipolente canonization" by Pope Francis on 9 October 2013 (here's an explanation of what that means). For an extended discussion of Angela of Foligno's Book, see McGinn's The Flowering of Mysticism: Men and Women in the New Mysticism--1200-1350, vol. 3 of his History of Western Christian Mysticism. *I've posted on Mechthild of Magdeburg and Marguerite Porete. I will add a post about Hadewijch of Antwerp, McGinn's fourth "evangelist," later in the year--but, in the mean time, there's a great introductory essay here.